TriMP4 enables smartphone users to tweak their video before sharing. The software operates with pre-compressed MP4. The editor removes unwanted parts of the video in just a couple clicks. The trimmer does not employ any encoding/decoding processes, supports K-Frame accuracy quality and keeps data intact. 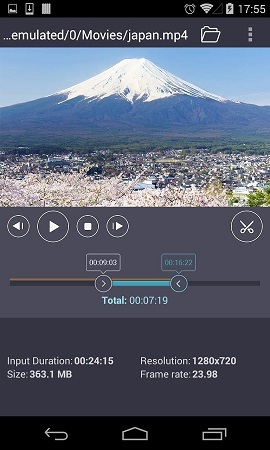 Solveig Multimedia unveils Video Splitter for Android, enabling smartphone users to tweak their video before sharing. December 2, 2015 – Tomsk, Russia. Solveig Multimedia, a provider of video editing and analysis software, announces TriMP4, a native Android application, subset of their acknowledged desktop solution – SolveigMM Video Splitter for Windows. Over the years, Video Splitter has topped industry ratings for seamless and lossless video editing. The software operates with pre-compressed FLV, AVC/H264, MP4, MOV, AVCHD, MPEG-2, MKV, MPEG-1, AVI, WMV, MP3, WMA files. The editor removes unwanted parts of the video in just a couple clicks, cuts and joins up video and audio streams. Like its desktop sibling, TriMP4 does not employ any encoding/decoding processes, supports K-Frame accuracy quality and keeps data intact. As smartphones and tablets outpace traditional cameras on the market, Solveig aims to introduce lossless video trimming to the booming mobile audience. 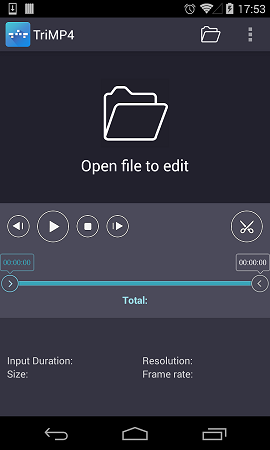 The software enables Android users to make necessary cuts in smartphone video before sharing. In contrast with competing mobile applications, Solveig focuses on ease-of-use, output quality and productivity rather than resource-hungry effects. • Maintained video orientation, and many others! The new app is available free of charge at Google Play and works smoothly on Android-based devices running ver. 4.0 and higher. Founded in 2003, Solveig Multimedia has been a leading manufacturer of digital audio, video and multimedia solutions for end users and professional developers. Solveig’s product line includes Video Splitter, HyperCam 3, Zond 265 and AVI Trimmer+.